Just southwest of the centre of Bled, I’m guessing around Planinska Cesta, there is a small group of houses – a hamlet, a little community. Dawn my wife went for a walk around that way one day and she told me she saw a board explaining the history of this part of Bled. Once there were vines growing on these slopes, it said. There isn’t a winery in Bled any more – I’m not sure if there ever was. 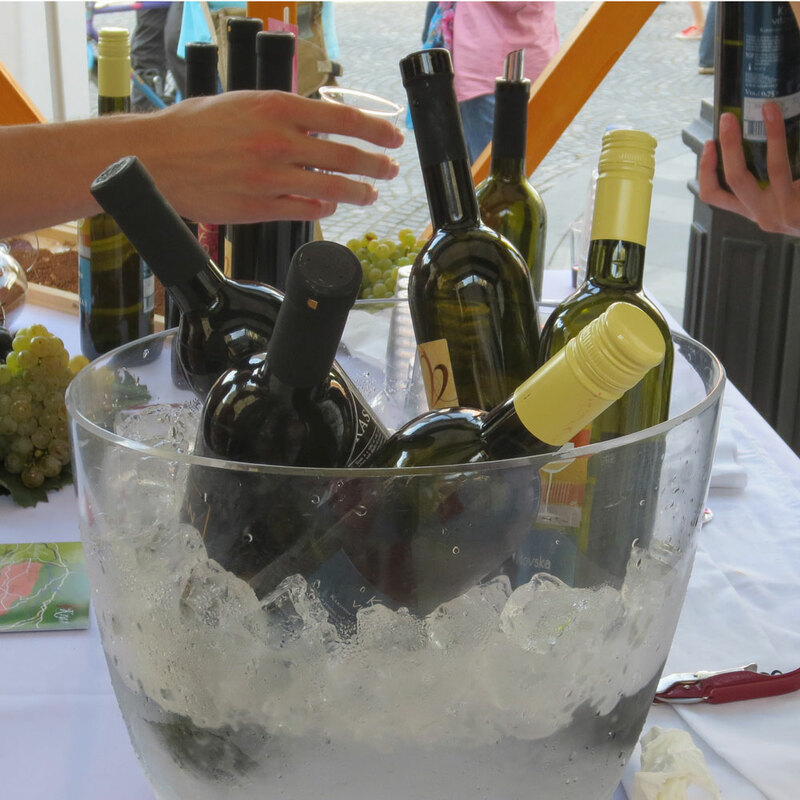 But there are places in the town to taste and enjoy wines from Slovenia and at least two wine tasting events held every week. This time on Bled Stories, Slovenian wine and wine tasting. And as a bonus, suggestions for the best bars and wine bars in Ljubljana from a young man about town who is in the know. Wine tasting in Ljubljana during Primorska wine event. It often comes as a surprise to first time visitors to Slovenia that this is a wine growing country. And sometimes it comes as an even bigger surprise to find out how good the wine is. “If it’s so good, why can’t I pick up a bottle in my local wine shop?” is a reasonable question. Well, it is estimated that only 6% is exported. The other 94% is consumed at home. 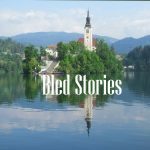 Hear more Bled Stories podcast episodes here on this website, or subscribe on iTunes. There is a section about wine in all editions of Firsthand Guide to Bled. This section on Slovenian Wine is taken from the book. and the 28,000 wineries, produce about 80 million litres every year. Slovenians like wine – but they hold on to it. The three main wine growing areas can also be day trips from Bled. Although personally I’d prefer to spend two or three days in any of them. Podravia – the Drava region – bordering Croatia and Hungary in the east of Slovenia is the largest area. You can get there by train or bus and if you are driving it’s just a couple of hours away. On the way you are likely to pass Laško where the beer come from. Posavska, the neighbouring Lower Sava Wine-growing region, is the only one of the three that produces more red wine than white, but not by much. Primorska, and especially the Goriška brda and Koper districts is probably the two best known and Vipava valley is a beautiful place. Travel from Alpine Bled to Mediterranean Koper and you might wonder about being in the same country. Jani Pravdič is a young man about town. He’s not from Bled, but from a little place near Celje. He began working in tourism out of college when he wanted to turn his passion – partying into a business. He organises the wine tasting in Bled and Ljubljana where the emphasis is put on having fun and learning the wine basics with trained sommeliers, while not being too serious. And while you can buy excellent Slovenian wine in the supermarkets, there are four specialist shops I know of. In the Shopping Centre, Trgovina Vino Bled is on the 1st floor. In the main shopping area Zakladi Slovenije / Treasures of Slovenia has a wine collection. My own favourite is Zdravljica wine bar where I will happily sit out in the sun in the afternoon, or inside at the big communal table in the evening with a bowl of nibbles and glass from their collection. You can taste before you buy. Of course, Bled Castle has its wine cellar and selection, and their experts on hand to advise you. If you are drinking there, the bottle might be opened for you by a man wielding a sabre. The vine growing at the Castle is a cutting from the vine in Maribor – the oldest in the world. The best time to visit to Slovenia to taste wine in around the beginning on November —- St Martin’s Day. The patron saint of wine making is celebrated around the country. Details of events in the book. And Fridays in Ljubljana at Open Kitchen in addition to trying food from the stalls, there are often Slovenian wine and beer makers showing off their products. 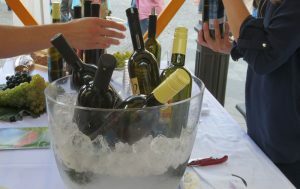 Wine Tasting Bled is held in Restaurant Murka, (Riklijeva cesta 9, 4260 Bled). Contact them ahead to book a place. Ljubljana wine tasting is held in Dvorni bar, Dvorni Trg 2, 1000 Ljubljana. The Bled Stories Podcast is a Firsthand Guides Production.